The criminal intelligence officer Ahmed Khozair who receives his orders from the Iraqi Prime Ministry continues to hamper transfer of patients to hospital. On Sunday, November 17, he prevented transfer of two residents to hospital. These two who are suffering from acute eye ailment had made an appointment with a specialist physician since months ago. Moreover, Ahmed Khozair punched holes in the identity cards of two interpreters of the patients making their cards unusable so that they may no longer be able to accompany patients. Patients and interpreters immediately referred to the UNAMI monitoring team who were present there and talked over this anti-human and unlawful treatment by Iraqi agents; but the monitors took no effective measures. 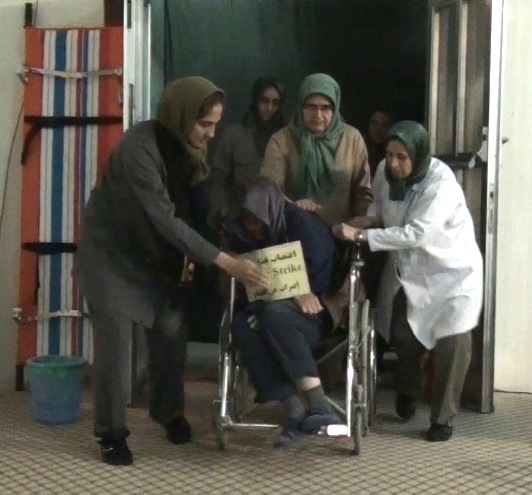 On November 15, one of the people on hunger strike at Camp Liberty suffered severe heart ailment and according to the Iraqi physicians had to be immediately taken to CCU section in Baghdad hospital, but the prime ministry forces stalled the patient’s transfer for an hour although this was in an emergency condition, keeping the patient at the checkpoint using various excuses. Ahmed Khozair is the same criminal who has been involved in the criminal attacks on Ashraf. He got stationed in Ashraf prior to the September 1 massacre and was busy preparing the ground for this great crime against humanity. Given that medical blockade imposed on Ashraf and Camp Liberty since 2009 is a salient case of crime against humanity and in the light of written and repeated commitments by the U.S. government and United Nations vis-à-vis safety and security of Camp Liberty residents, the Iranian Resistance calls for immediate intervention to end this anti-human siege and for securing free access of all Camp Liberty residents to medical services.